Yesterday I reminded that it is important that we not succumb to stories and narratives designed to give us false memories, to re-write history, as we honor and remember President George Herbert Walker Bush. A colleague made a spot-on comment by saying that it is much easier to read the headlines about Mr. Bush, especially the New York Times and Washington Post, if you have no memory of anything before the year 2000. Remember that the opinion of George H.W. Bush in the Washington media was that he was a wimp and that his vice president, Dan Quayle, was incompetent – both assertions being clearly contradicted by fact. 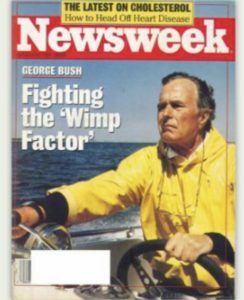 And lest you think the trashing of Bush by the liberal media began in the re-elect effort when the national media that runs the Democratic Party decided to rally around Bill Clinton, remember the infamous 1987 Newsweek cover released as Bush announced he was first running for president. Newsweek cover, October 1987 after V.P. Bush announced he was running for president. Yes, one of the nation’s most read news mags at the time called a man who was an avid outdoorsman and sportsman, a man who had run the CIA, and a man who had earned the Navy’s Distinguished Flying Cross in combat, a “wimp.” It was a media hit job to make the more bookish man, only when compared to Ronald Reagan, look weak and feckless. The hypocrisy of the media, the biased reporting, the actively working for Democrats and to destroy Republicans, is nothing new – especially to those with a memory beyond a decade.